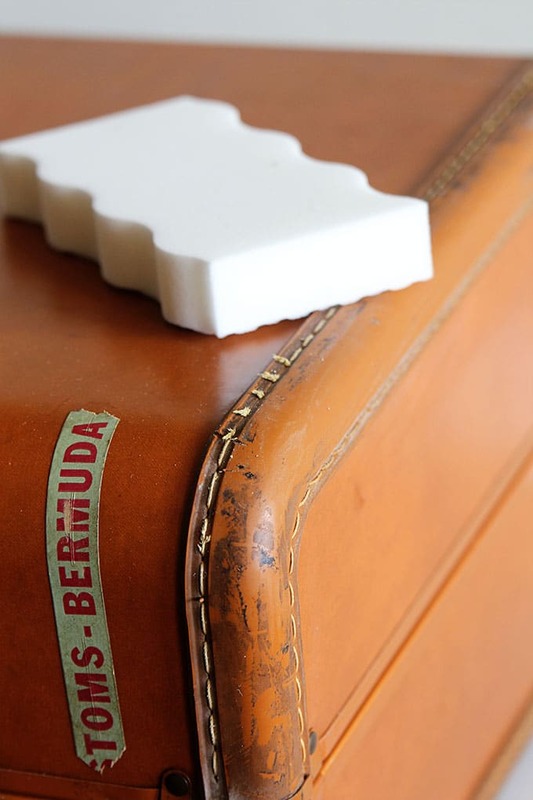 Tips for cleaning vintage suitcases both inside and out. 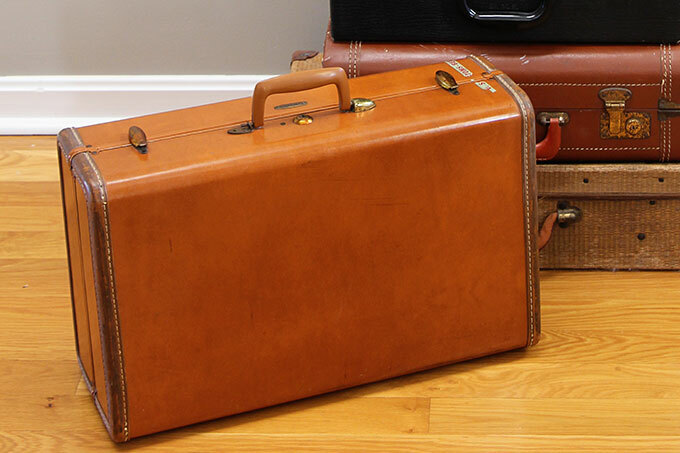 Removing odors from vintage luggage is easier than you think! Normally I’m a sniff it before I buy it kind of person, but occasionally I’ll buy something at a thrift store or yard sale in a hurry. Only to be gifted with a pungent aroma when I finally get around to sticking my nose in it. And that is what happened with the suitcase I showed you in my last post about Shopping Church Rummage Sales. Yes, my baby had an odor issue. Not a someone stored a dead body in here kind of odor, but more of a someone left their damp bathing suit in here for too long kind of odor. And since I like to store craft supplies and fabrics in my vintage suitcase hoard, I needed to get rid of that odor pronto. and quite a few musty spots on the outside of the suitcase, so it was time to get out the big guns. To clean the ouside, dampen the Magic Eraser and use it to wipe off any scuff marks, grimy areas (the handle on this one was DISGUSTING) or sticky tape marks. 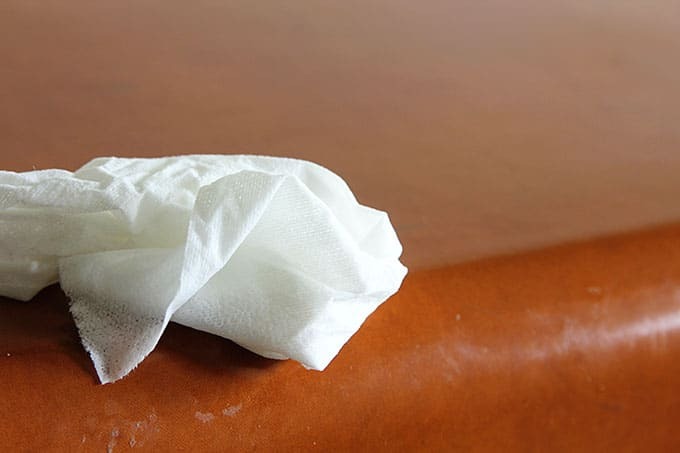 If your suitcase is leather, wipe the outside off with a leather wipe to get rid of any mustiness and dirt. 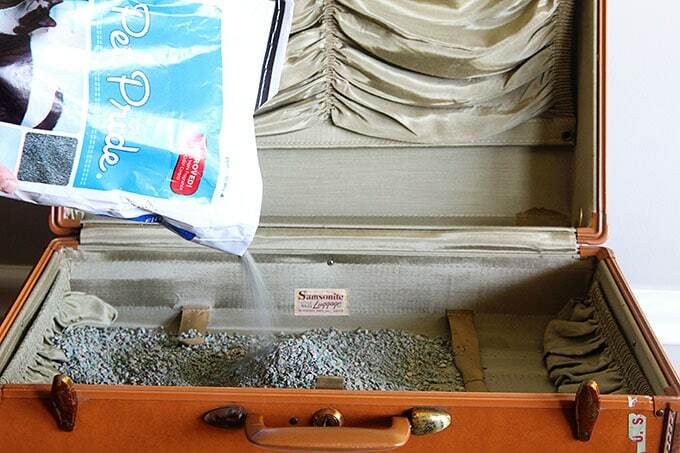 If your suitcase is plastic, wipe the outside off with soap and water. If your suitcase is wicker, do a happy dance because I hardly ever find wicker suitcases and then proceed to vacuum the outside off. You can very very gently use soap and water to try to clean up any stains, but in my experience the wicker on these things is very fragile, so be careful. Vacuum out the inside of the suitcase including the pockets (which totally skeeves me out, because for some reason there are always crumbs in there). If the inside smells (and most old suitcases come with some sort of baggage (hardy har har), fill the bottom of the suitcase with cat litter, close it and leave it for a few days. When you open it, remove the cat litter and vacuum up the remaining cat litter dust. You should be good to go. BTW, around the outside of my piece of luggage there was a band of leather that was particularly scuffed up. I picture the previous owner kicking this poor little suitcase across the train station floor. I cleaned up a portion of it with the Magic Eraser, but then my inner “junkie” self decided that I liked the worn, been around the world and saw my fair share of adventure look of it. Same with the U.S. Customs/Bermuda tape. I thought it gave it character, so I left it there. And what do I do with my vintage suitcases you might ask (actually a lot of people do ask)? I use them to store sewing stuff, craft supplies, fabrics and linens. And set vintage cameras on them apparently. In this new one I have a vintage quilt and a few vintage kitchen towels that I’m not using right now. I don’t want to get rid of them, but I also don’t want them just setting out gathering dust. So vintage suitcase to the rescue. 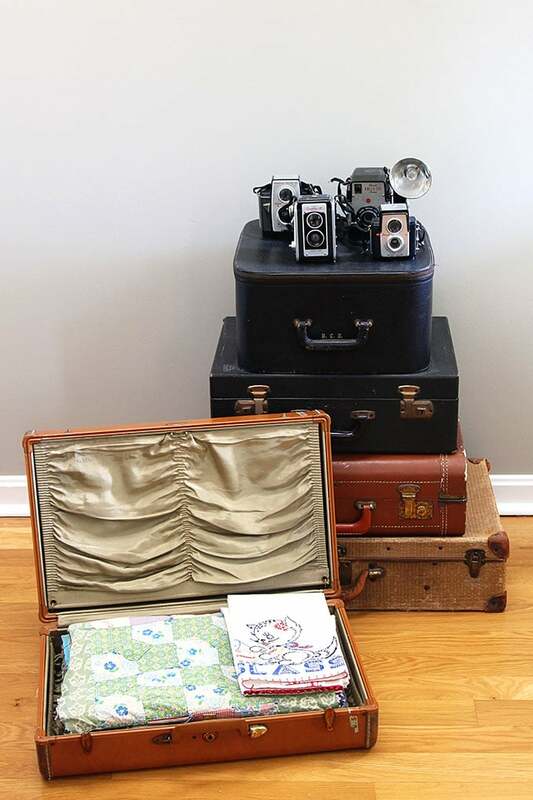 Are you a vintage suitcase hoarder collector? What do you store in yours? 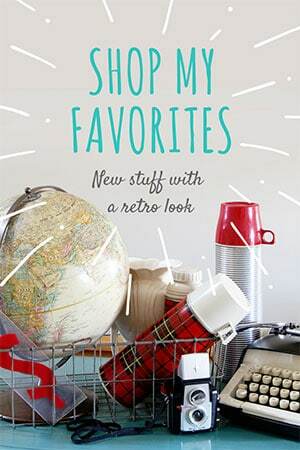 If you liked this post you may like my Online Resources For Vintage Lovers page. 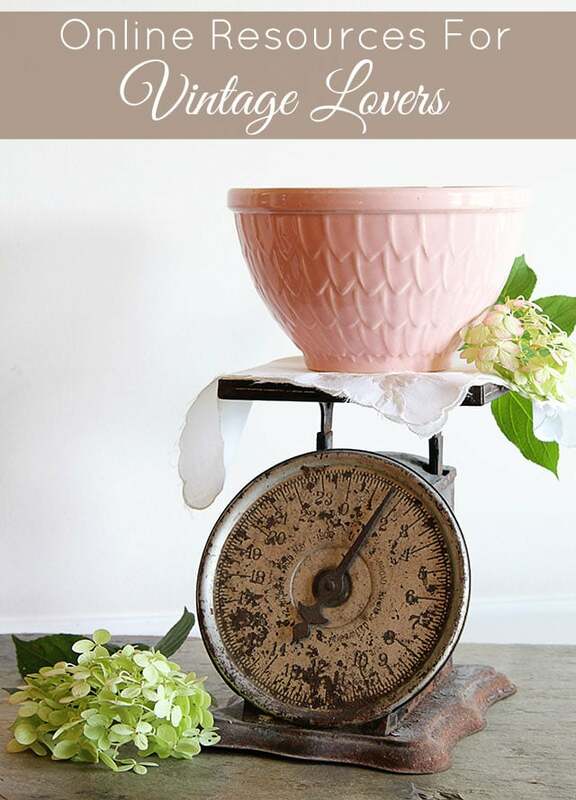 And my Top 5 Things To Look For At Yard Sales This Year. Love the cat liter trick. Here I’d have to close that suitcase lid real quick or my two kitties would think I got them a new potty. 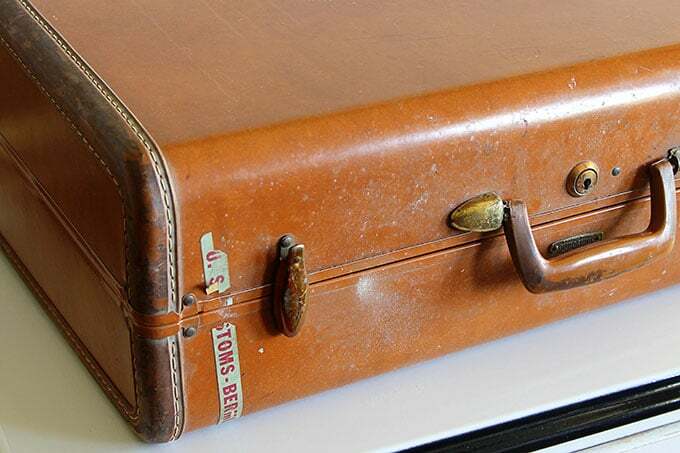 vintage suitcases are very cool, indeed. The cat I used to have would jump in a suitcase as soon as it was open and “do stuff”. Whenever my mom would visit she would find presents in her suitcase if she left it on the floor 🙂 She never learned and neither did the cat! Your blog posts always make my day. Love your sense of humor. 🙂 Today’s subject was quite timely. I have a few new additions to my collection of vintage suitcases and needed some help in “refreshing” them. Like you, I almost always smell my items before purchasing. My husband thinks I’m a reincarnated canary from the mines. Will start cleaning them today. Thanks for the great tips. I sometimes use good ole’ shoe polish is I want to give it a bit of shine and remove scuffs or as you said leave it in its natural condition. We went to a few yard sales this weekend rather late in the day and there was so much free items on the curbside for the taking as we did ask. I found a French round clock that has seen better days but I like the colors on it and the old Paris scene. I just need to get new clock guts to keep it running. As always Pam your sense of humor is enlightening. I bet you were in Heaven with all the curbside finds! That clock sounds amazing! I have used this trick many times! It has been a life saver! Isn’t it! I think suitcases tend to be stinkier than other things because people store them in their basements and attics, so I’m glad there’s a way to get the smell out! Love your ideas and keep up the good work. 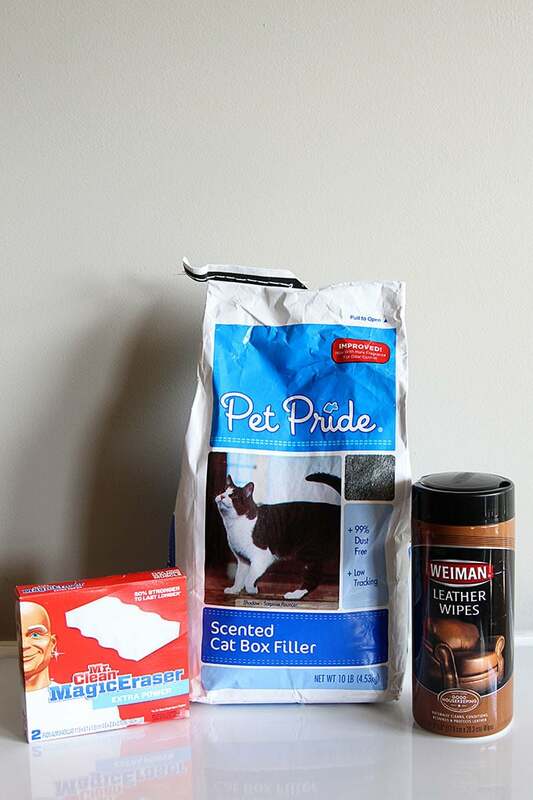 Instead of dusty cat litter you might try some products that I have used recently with good results. I purchased all of them at Bed Bath Beyond. Freshwave Odor Removal packs (6); AirBoss Charcoal Closet odor removal; SmellsBeGone Odor Absorption Gel (Freshwave has similar product). I also bought a package of what looked like white lava rock stones in a open weave mesh bag that I used successfully used in my wine refrigerator after my two cats chased a mouse under the unit and it died! With no way to extract the problem I went to BBB and found those lava rocks and absorption gel packs worked wonders and no stench. Geez … the STENCH .. lasted for 10 days until I got busy and creative. Just a thought! Sorry I can’t remember the brand name for those rocks but they are magic and not messy and likely can be reused for some other awful event! Wow! I have not heard of the lava rock things before, I’ll check them out. I have tried that AirBoss charcoal closet stuff before. In my closet though. I never thought to use it in the suitcase, but that is sort of the same concept as the cat litter, which works because it has charcoal in it I think. Great ideas, thank you! I have some of those. Use them in my bathroom to remove moisture from sweaty toilet and showers. Didn’t know you used them as deodorizer, I that bathroom never has bad odors. 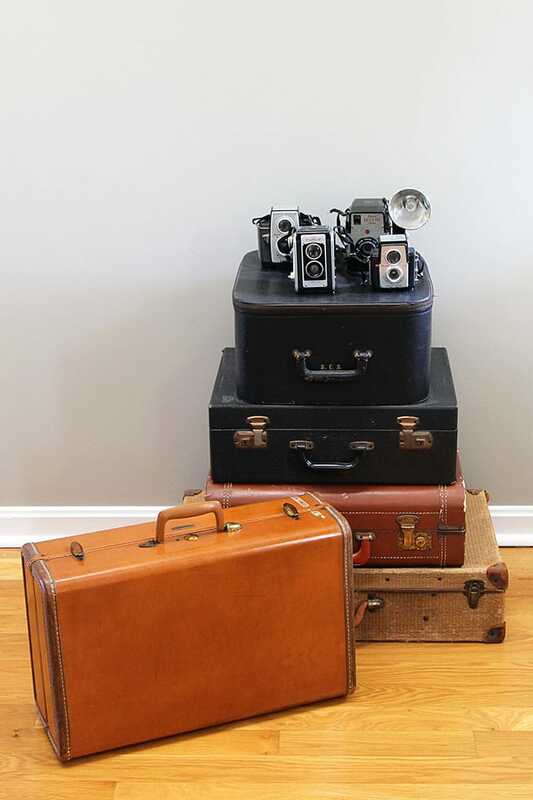 I have a stack of 12 vintage suitcases in my guest room holding Christmas & Easter decorations. Thanks! Uh . . . why have I never thought to store holiday stuff in them??? That sounds like a perfect place to hide it away for 11 months out of the year! Wow, what a cool and interesting post! Love your post too. Actually an old suitcase is exactly where I store our old bathing suits & beach towels! Isn’t that funny? It’s stored on the top shelf of the closet where I have to stand on a ladder to get it…shows how often we go swimming…LOL…not often. Anyway, I have heard of the cat litter trick, but have never tried it. I have cleaned up many an old suitcase though. I actually like the musty smell…weird I know. Thank you so much for your very informative post and your hilarious comments! 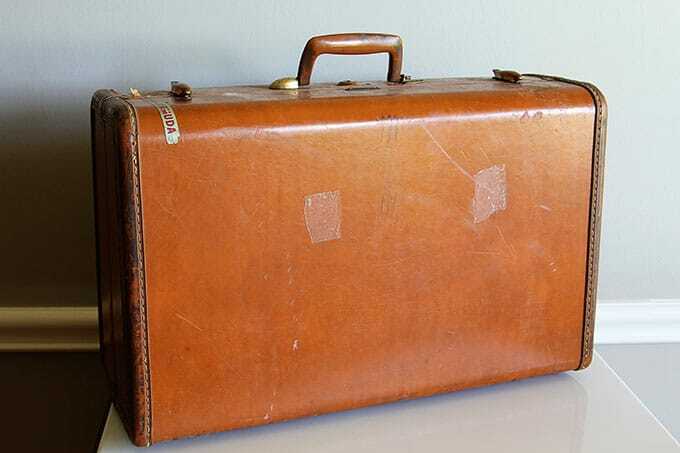 I know you’ll cringe when I confess I have declined to buy vintage suitcases due to their overwhelming musty smell (I like a little, but not too much) and oftentimes due to seemingly impossible to clean conditions. Now I am armed with your information and will be much more amenable to buying these really awesome suitcases. Thanks to your readers for storage tips, too! Those work great! Love your ideas! Thanks for sharing! GREAT idea! I will try that on one of my other suitcases. I have a stack of 6 in my bedroom. I store off season things in them like tights (I wear a lot in the winter and they are usually a tangled mess in my drawer), off season jammies, thermal undies etc. that aren’t used much. Also use one for my collection of purses that I alternate occasionally. I love them and always do the sniff test too. I’ve never tried the cat litter – I usually pass if they stink. My husband will be sorry I learned this. He thinks I have way too many. 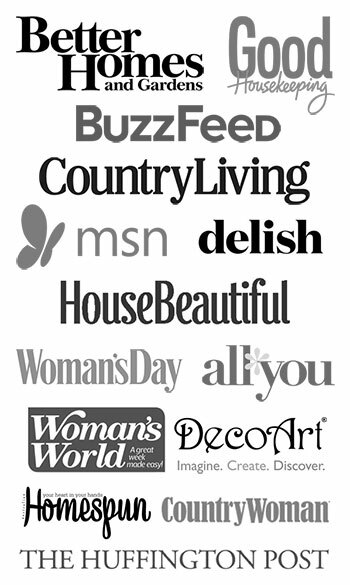 I also have several I use for my craft show displays. 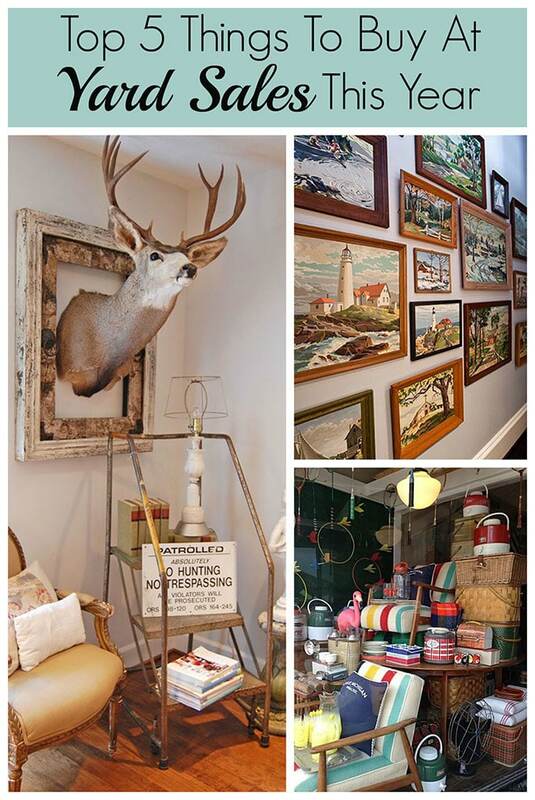 A great display draws people to your space and I always get lots of comments about them. So easy too – when the shows over, close them up and haul them to the car. I haven’t started collecting suitcases yet, but I do collect old wooden trunks. I can’t wait to try this on a few! I love my trunks because it gives me so much storage room! My hubby gets a little annoyed when I want another one, but he keeps buying them, so I’ll keep filling, stacking & displaying them! Wow, I bet they look great all stacked up! I love the idea that storage doesn’t have to be ugly (although I do have a few of those “colorful” plastic bins hidden in the basement). I use mine for decorations for all the different holidays. I also store yarn in them. I have all my transfer craft supplies in one, my embroidery supplies in another. I have a small one full of ribbon and a large one full of patterns. I keep an empty one handy to toss junk into when someone calls to tell me they’re dropping by. A friend of mine said she used cheap vodka to clean musty antiques. I’ve heard that too! I’ll have to try it next time I run across a “stinker”. Any tips on getting intense nicotine smell out of a mid-century satin lined train case? 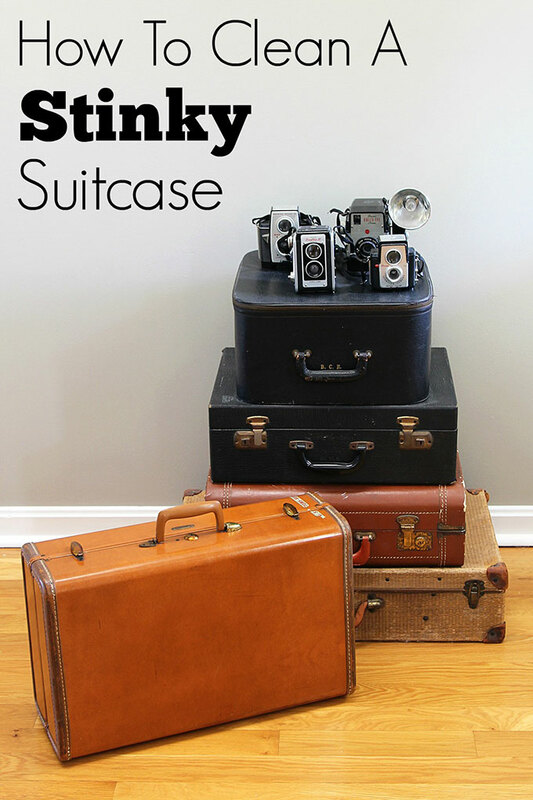 I have 3 old suitcases in good condition that I use stacked as a lamp table. I store craft magazines and old photos in them.